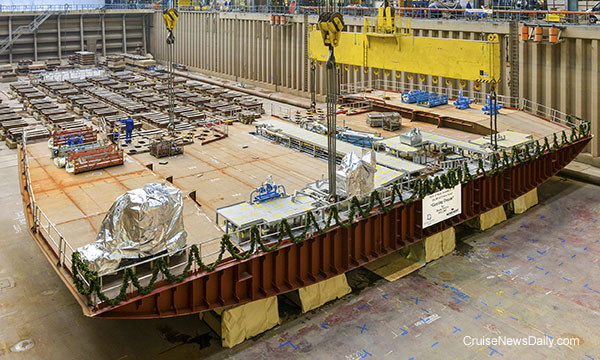 Meyer Werft laid the keel for Genting Dream Thursday at their Papenburg yard. The newbuild carries the yard number S.711. The first block, weighing 740 tons, was lowered into place in Meyer’s covered building dock. It is resting on the traditional lucky coin that was placed on the bracing by Genting Chairman Tan Sri Lim and Bernard Meyer. It is the first of 92 blocks that will comprise the ship. The complete story appeared in the December 4 edition of Cruise News Daily. MSC Crociere said they will double their capacity homeported at Havana already next winter with the deployment of a second ship. Details appeared in the December 4 edition of Cruise News Daily. Early-boarding passengers on Norwegian Sky had to disembark and wait in the terminal while authorities searched the ship this afternoon for a suspicious passenger who didn’t have his cruise card scanned when he boarded. It may have been twenty years ago today that Sgt Pepper taught his band to play, but it was fifty years ago today that Princess Patricia set sail to Mexico and Princess Cruises was born. 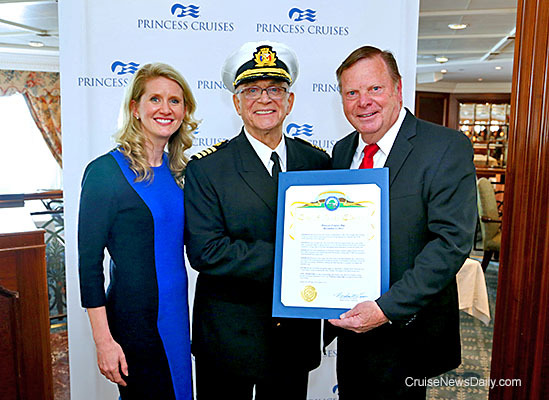 To mark the anniversary, today was proclaimed “Princess Cruises Day” in the County of Los Angeles and the City of Santa Clarita, the location of Princess Cruises World Headquarters. To mark the day themselves, Princess celebrated aboard Pacific Princess at the Port of Los Angeles. Special guests were the original “Love Boat” cast. Later this afternoon, Pacific Princess set sail on a throwback cruise, recreating the very first itinerary to the iconic Mexican Riviera. The complete story appeared in the December 3 edition of Cruise News Daily. 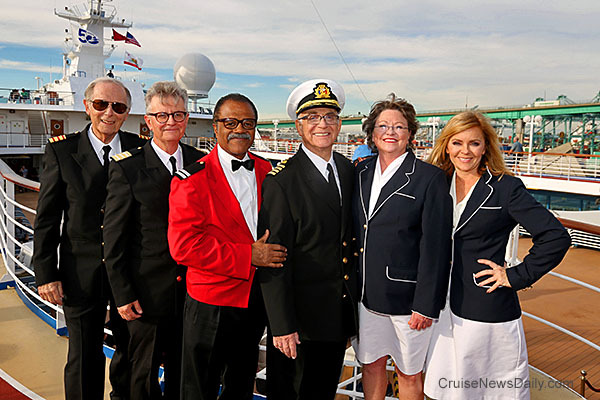 Special guests at today's celebration aboard Pacific Princess was the original cast of "The Love Boat," and it looks like Princess bought them new uniforms for the occasion. Shown are Bernie Koppell, Gred Grandy, Ted Lange, Gavin MacLeod, Lauren Tewes and Jill Whelan. Today was proclaimed "Princess Cruises Day" in the County of Los Angeles and the City of Santa Clarita. Accepting the proclamation was Jan Swartz, the president of Princess Cruises, and Gavin MacLeod. It is being presented by Bob Kellar, Mayor Pro Tem of Santa Clarita. Photos courtesy of Princess Cruises. All rights reserved. May not be copied or used without permission. Carnival Cruise Line is adding their first nonmusical performer, comedian Kathy Griffin, to their Carnival Live program. Holland America's Zuiderdam achieved another perfect score for the line on the US Public Health inspection Monday. Details appeared in the December 3 edition of Cruise News Daily. Genoa, December 3 2015 - Effective December 1, 2015, Christian Schönrock is taking up the position of Vice President Newbuilding Costa Group. In this newly created role he takes over the responsible for all newbuilding projects of the brands of the Costa Group: Costa, Costa Asia and AIDA Cruises and reports directly to Michael Thamm, CEO Costa Group. Christian Schönrock has been with AIDA Cruises since 1995. Starting with the first newbuild AIDAcara, he has been involved in all newbuilding projects for AIDA Cruises. As Director Newbuildings he successfully launched the seven ships of the AIDA Sphinx class, built at the Meyer Werft Papenburg, Germany. From 2009 onwards he and his team developed the next AIDA ships generation, which are under construction at MHI Nagasaki, Japan. AIDAprima, the first of the two sister ships currently under construction in Japan will start on April 30, 2016, from Hamburg its first seven-day round-trip voyages visiting the metropolises of Western Europe. The passengers aboard Grand Princess this week may not be getting the Hawaii cruise they bought, but they are getting the ultimate experienced cruiser’s dream: a two-week cruise with 12 sea days, two days in Hawaii - and it’s FREE - and if that’s not enough, they get a discount on another cruise. This all comes as a result of the changes necessitated by the repairs required after the propulsion circuit breaker failure on Grand Princess Monday. We also reported on the death of Mike Moulin, the former commodore of the Princess fleet. Viking Ocean Cruises will be bringing their brand of small ship (47,800 tons) cruising to the Caribbean in the 2016/2017 season. For the line’s first venture into the market, Viking Star will sail a relatively short season, starting with a 14-night repositioning cruise from New York to San Juan on October 14 (2016), and heading back to Europe from San Juan already on February 27 (2017). Details appeared in the December 1 edition of Cruise News Daily. Get out your poodle skirts and leather jackets and head down to the theater on Harmony of the Seas and Independence of the Sea, because Royal Caribbean has licensed the Broadway musical version of “Grease” to headline the entertainment on the two ships. Grand Princess is currently sailing on a 15-day Hawaii cruise from San Francisco, and this morning about 5:30am as it was sailing toward its first port of Hilo, and about 20 miles off the coast, the ship experienced a significant failure in a propulsion circuit breaker in the aft electrical switchboard. There was smoke and a small fire which was contained in the electrical switchboard. The incident caused a power outage for a short time, but power has been restored and all hotel services are back in operation. Caribbean Princess was a day late turning around at Houston this week. There was also an interesting twist Sunday afternoon while the ship was anchored 10 miles offshore. Last week P&O Australia added two ships to their fleet. Designer Darren Palmer gives us the first look aboard, and they don't look like their former selves. He says it's modern Australian design at its best. We think he's right. You can judge for yourself by watching the video below.